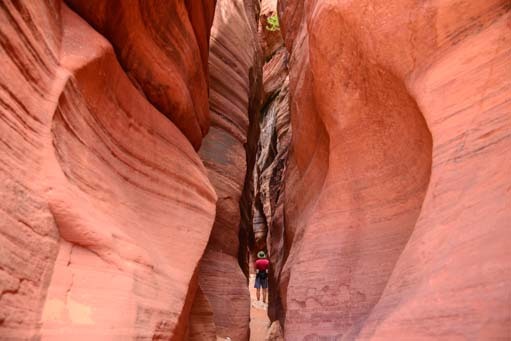 Wire Pass Trail - Slot Canyon Hiking! 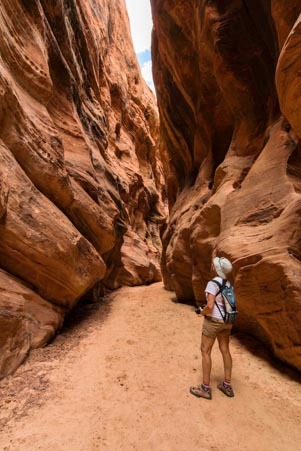 Wire Pass Trail – Slot Canyon Hiking! The slot canyon is barely visible from the outside. May, 2014 – The beautiful red rocks and views of Sedona, Arizona, are utterly enchanting, but the exotic Vermillion Cliffs two hundred miles north lured us away. 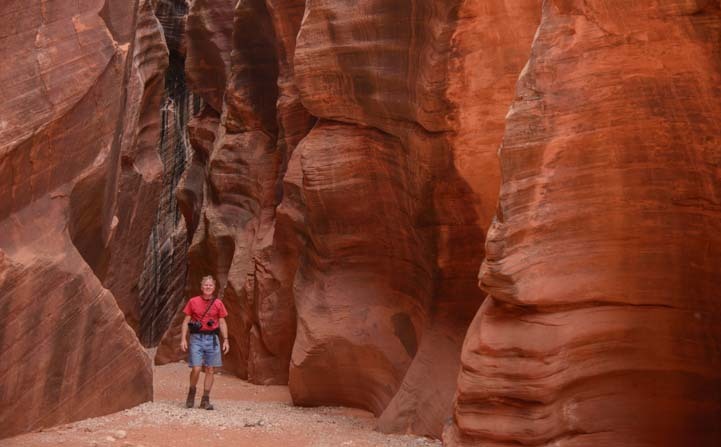 We have driven past the fantastically colored rock walls along routes 89 and 89A between Page, Arizona, and Kanab, Utah, many times in the past. However, this time we stopped for a while to explore the area in a little more depth. Heading into the slot…it’s skinny! 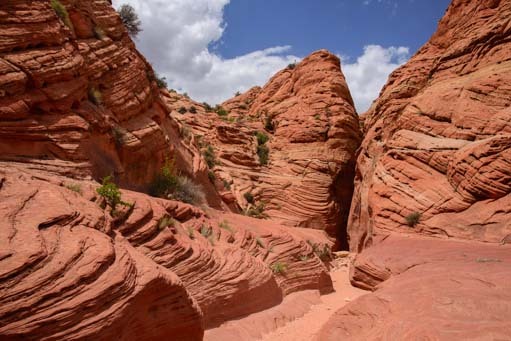 Where the West Fork Trail is one of the premier hikes around Sedona, the Vermillion Cliffs‘ ultra popular hike, “The Wave” and nearby Buckskin Gulch Trail are two of the signature hikes in this area. It’s not just skinny, but tall! The Wave requires a permit that is given out by lottery or reserved months in advance. Everyday while we were there, 100 people vied for ten permits that were passed out at the Kanab BLM office 40 miles from the trailhead. Yikes! That was way too complicated for us to do this time around! 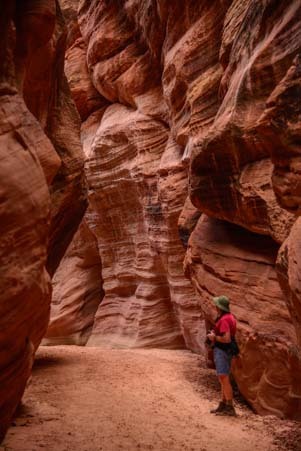 But the gorgeous slot canyons in the area use a self-pay permit system at the trailhead ($6 per person) and are open to anyone willing to hike skinny! 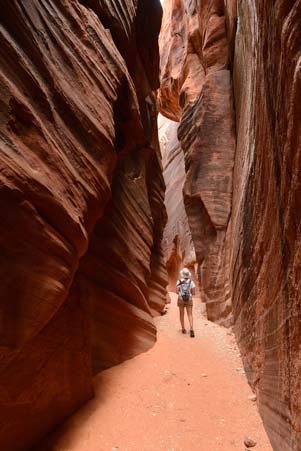 So off we went to the Wire Pass Trail which passes through three glorious slots on its way to the confluence with the Buckskin Gulch Trail. 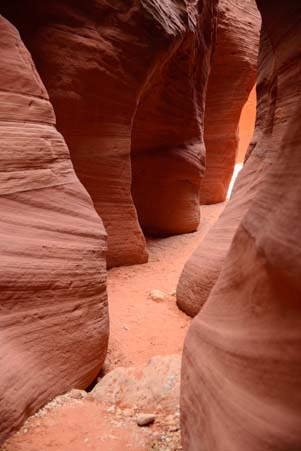 Sleak, wavy curves in the slot canyon. 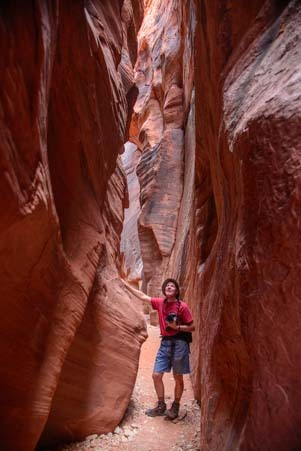 We were in total red rock awe as the rippling walls of burnt orange stone rapidly rose up around us. 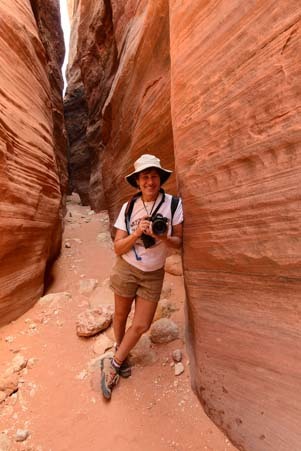 We first experienced slot canyon hiking at Little Wild Horse Canyon near Goblin Valley in Utah. When we slithered through those slots a few years ago we were spellbound. What fun! 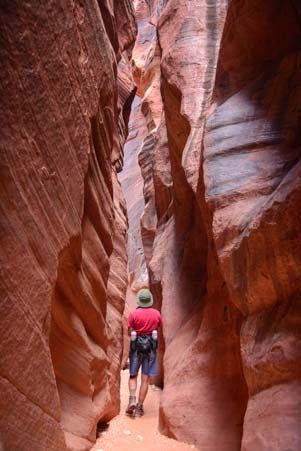 Wire Pass Trail is every bit as beguiling, and it takes a lot less hiking to reach the slot canyons. The slot is actually a very comfortable width. We baked in the sun us as we hiked in a sandy wash for the first few tenths of a mile. We were going very slowly because the cameras kept begging us to stop! 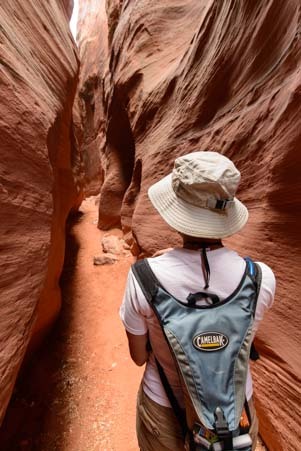 When we finally slipped into the slot canyon, we found the air refreshingly cool inside. What a cool place (literally!). The magically undulating waves of stone were even cold to the touch. The slot was narrow, but not uncomfortably so. Tipping our heads way back, we could see a thin strip of blue sky high above us. At one point a crow flew along that blue ribbon of sky, carrying a bit of nesting material in its beak. 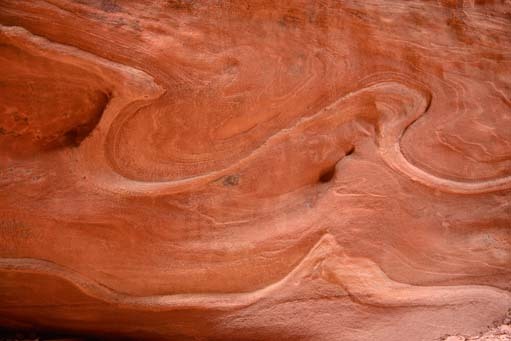 The sandstone walls have wonderful patterns…some look like waves! Mark made his way through the nooks and crannies of the slot ahead of me, and in an instant he was swallowed up by the massive rock walls. Each twist and turn of the rocks was unique, and they seemed to fold open and closed like an accordion. Mark emerges from the slot… Wow!! There are three big drop-offs, but a little scrambling is all that’s needed. There were three places where there was a drop-off of five feet or so, but these were easy to negotiate, as someone eons ago had wedged very sturdy logs into place. The logs are silky smooth from the oils of a thousand hands that have rubbed on them, but there are notches and handholds in all the right places so you can scramble up or down with ease. At the end of the third slot we found ourselves at a T-intersection in a vast open area where the sheer rock walls pierced the sky. Every step here was a “wow” moment! The hike continues either left or right, but our cameras had slowed our pace down so much that the mere 1.7 miles we had covered so far had taken us three hours! We retraced our steps, finding each slot to be a brand new experience in reverse, showing us new contours and shapes in the changing afternoon light. 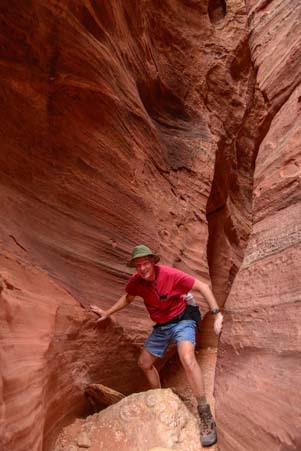 The slot canyon walls tower above me. 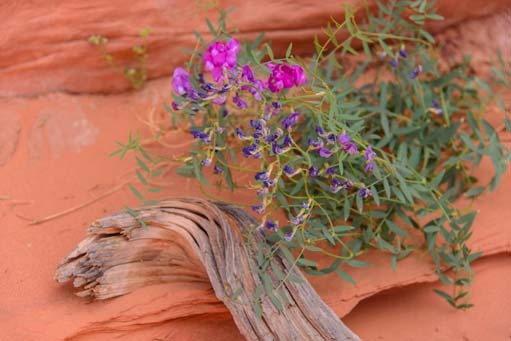 At once point, outside the slots, we found a vast rock overhang protecting the most lovely still-life of a purple wildflower set against a weathered log in soft pink sand. It was so perfectly positioned that it seemed as though someone had set it up for us to photograph. But no, the roots were solid in the ground and the little flower had grown up around the log. Between the slots we found a beautiful wildflower and driftwood still-life. This was Art of the finest kind, created by a truly divine hand. After hours of hiking, and armed with hundreds of photos to download and review, we bounded back to the rig in high spirits. For info about the Wire Pass Trail and other places in the Vermillion Cliffs from the BLM and Wikipedia, click here and here. 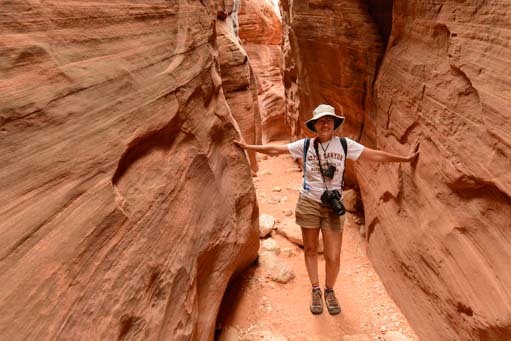 This entry was posted in Utah and tagged Arizona Northeast, Hiking Red Rocks, New, Slot Canyon Hikes, Travel, USA, Utah, Utah Southeast, Utah Southern, WP Travel by Roads Less Traveled. Bookmark the permalink.